The game is similar to the well-known game Boulder Dash and to Superior's own Repton series in that it mostly involves digging through a cave displayed as a rectangular grid of squares. However the mechanism of the game play is slightly different. The player controls a character called Bono, who operates a soap business for sea-monsters. He collects bones from goblins wandering around the screen: normally goblins walk around the cave tunnels in a pre-set pattern, but if a goblin is trapped by earth, walls or rocks so that it can't move anywhere, it dies and becomes a skeleton. Bono can then collect this skeleton and take it to his home. Once he has collected enough skeletons, he can make soap from them and take it to a monster awaiting a bath. 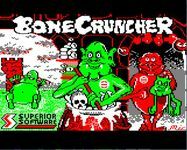 Source: Wikipedia, "Bonecruncher," available under the CC-BY-SA License.